Service can happen anywhere you are. While attending a volunteer event may plant a seed of caring in your child’s life, keeping the conversation going about the importance of service is critical to making it a habit. Check out these resources for some help in doing just that. 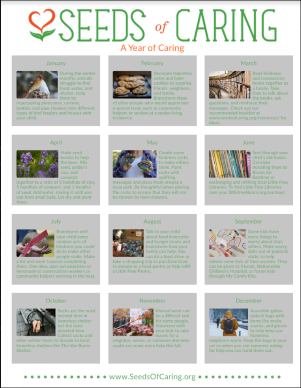 Sign up with your email to receive inspiring news and stories from Seeds of Caring. Seeds of Caring empowers kids to create a kinder community with their hearts, hands, and minds. The organization is a 501(c)(3) nonprofit. Photography by Rachel Joy Barehl. Design by Carrie Krebbeks, Erin Jeffries & Jennifer Stevens.